Like all enthusiastic teachers, you want your students to see the connections between important science concepts so they can grasp how the world works now—and maybe even make it work better in the future. But how exactly do you help them learn and apply these core ideas? 1. Physical science core ideas explain phenomena as diverse as why water freezes and how information can be sent around the world wirelessly. 2. Life science core ideas explore phenomena such as why children look similar but not identical to their parents and how human behavior affects global ecosystems. 3. Earth and space sciences core ideas focus on complex interactions in the Earth system and examine phenomena as varied as the big bang and global climate change. 4. Engineering, technology, and applications of science core ideas highlight engineering design and how it can contribute innovative solutions to society’s problems. 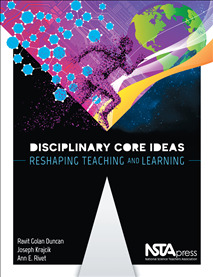 Disciplinary Core Ideas can make your science lessons more coherent and memorable, regardless of what subject matter you cover and what grade you teach. Think of it as a conceptual tool kit you can use to help your students learn important and useful science now—and continue learning throughout their lives.